Jolly Pets Flathead Alligator Dog Toy is designed for hours of chewing, tossing and tugging fun. It’s a durable stuffing-free toy that’s great for a stress-relieving game of tug-o-war or just tossing around the house. 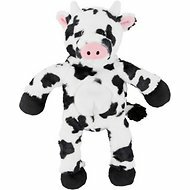 The stretchy, weave body holds a built-in squeaker and also helps floss and clean teeth while chewing. My baby girl had so much fun pulling it apart. Nothing is safe with my baby girl she's a pit mix with mastiff. 45 minutes after the Chewy box was raided....A picture is worth a 1000 words. 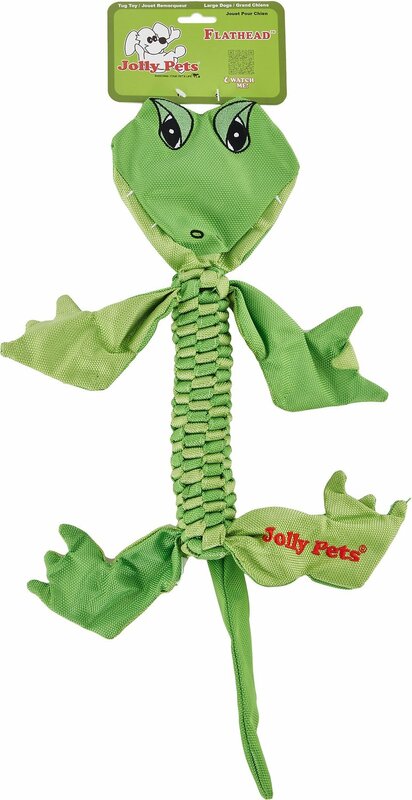 Love jolly pet toys! My golden’s favorite toy the crab was out of stock so I ordered the alligator for my dog, Gator. He loves it! This toy has been so fun for my dog and it’s surprising tough! So adorable. Just not for a pitbull lol. Gone in 5 minutes. My puppies love these toys. 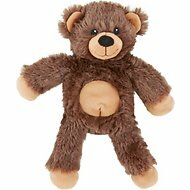 They are durable and they love the crinkle and texture. My puggle loves this,but its already coming apart.This would be a great toy if the material was thicker.After 20 min of catch the material started coming unraveled in the middle and there are many small holes in it just from catching it.I give it a few more days and the material will be shot.Squeaker didnt make it long either.This would be good for a puppy or toy dog due to the material being so thin. My dog loves getting his chewy box and looking for his new toy! I went with this alligator to try something new (no fluff, no squeaker)and my gsd still managed to rip the alligator's face off within 24 hours! He loves it though because we are still playing with the body of it like a tug rope!